Remember when WhatsApp went down about a week ago? That was definitely the worst time for the mobile messaging service to go down – since Facebook announced that they have acquired WhatsApp, many people have been talking about switching to another messaging app and that downtime just gave some of them a final push. Now, we’ve been hearing a lot about the popular messaging apps like Line, Kakao Talk, WeChat and such, but one particular player received the most attention ever since the whole WhatsApp deal started, so what app (no pun intended) is that? 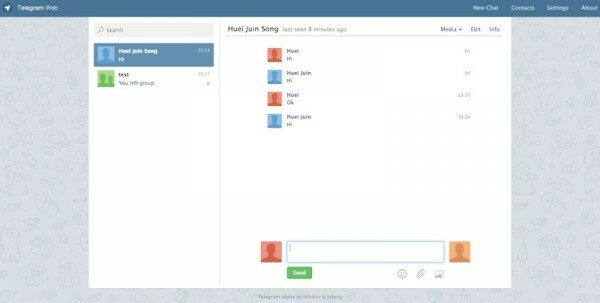 It’s Telegram. 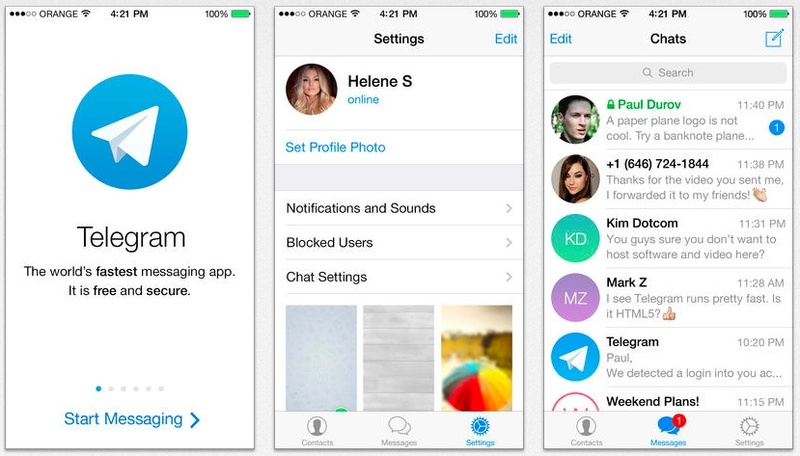 Now, Telegram isn’t new per say, the mobile messaging app has been around since August last year but before the whole Whatsapp fiasco, they only had about 300,000 to 400,000 downloads per day. Ever since Facebook announced its major acquisition, the growth rate jumped to about 800,000 to 1 million new downloads a day across different platforms. On the day WhatsApp went down, Telegram added a whopping 1.8million users and as of 24 February, it added another 4.9million downloads and soared its way to one of the top apps in the App Store – no.4 on iOS. Now, what exactly is Telegram? 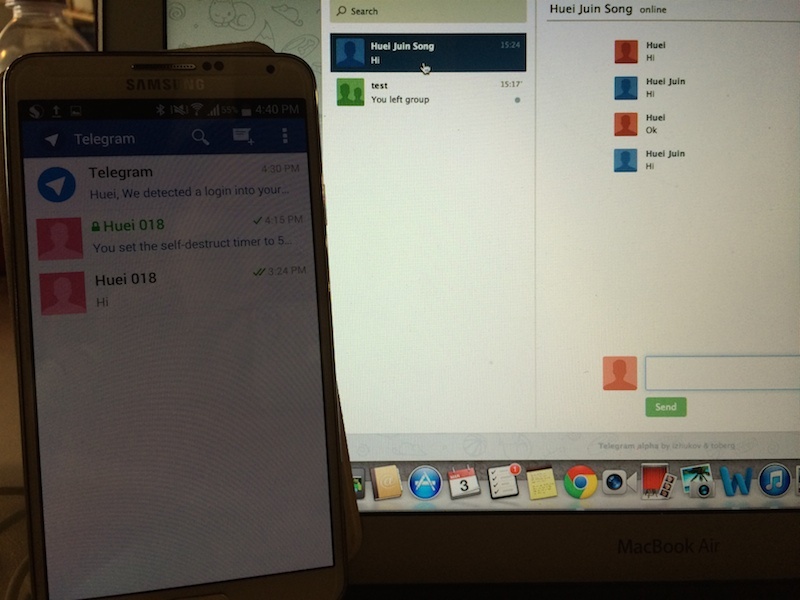 Telegram works just like all the other mobile messaging apps out there, particularly like WhatsApp. It doesn’t have all the fancy stuffs like colorful layout, animated stickers, official profiles for you to “follow”, no social network service like a Timeline for you to share status updates and pictures, or the ability to add random strangers like WeChat – Telegram is just a simple messaging app that allows you to send messages, pictures, videos and even files to your friends, but here’s the best thing, it’s completely free. No ads, no stickers for sale and no subscriptions are required. 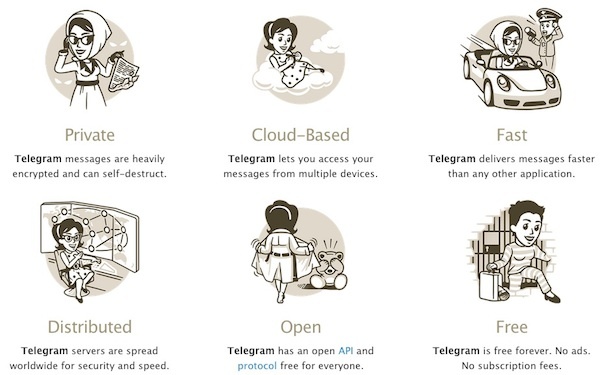 Telegram also boasts to be one of the safest mobile messaging apps out there with heavy encryption to keep all your data safe. 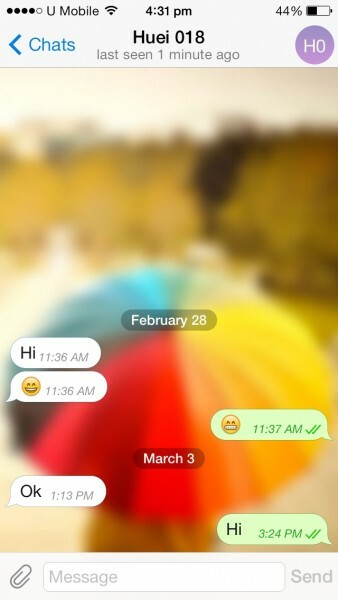 In addition to that, it also has a Snapchat-like feature for extra privacy called Secret Chat. In Secret Chat mode, encryptions are client – client and chat data will not be stored in the cloud. Users can also set a self-destruction timer for the messages so they can be seen and be deleted forever. 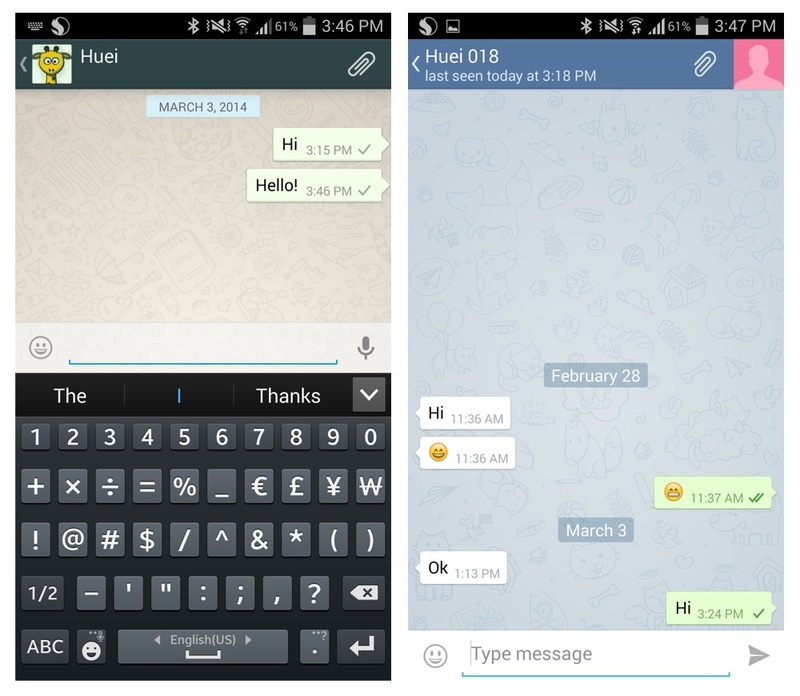 So enough with the basic, how does Telegram stack up to WhatsApp? Let’s take a look. Design wise, both apps look pretty much the same, which is a good thing because there will be little learning curve if you switch. 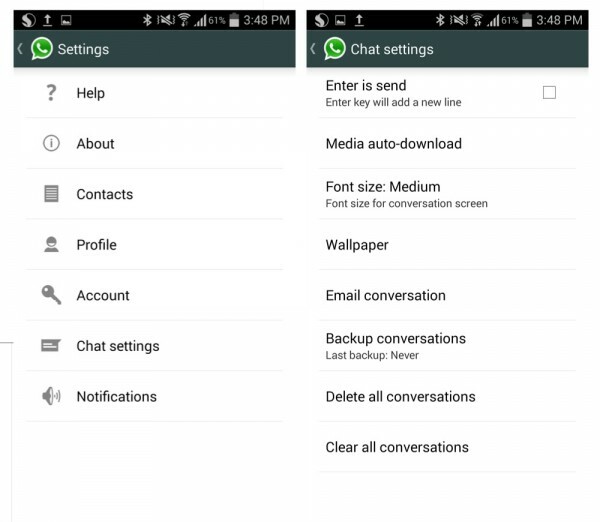 Everything from the main interface, the chat menu and even settings are very similar in both platforms. Chat interface in WhatsApp and Telegram. Even the default wallpaper looks similar. Sending message on both WhatsApp and Telegram are very similar too, you can change the wallpaper in your chat menu on both apps, send existing photo in your gallery or capture a new one to send, send video, document and your current location. 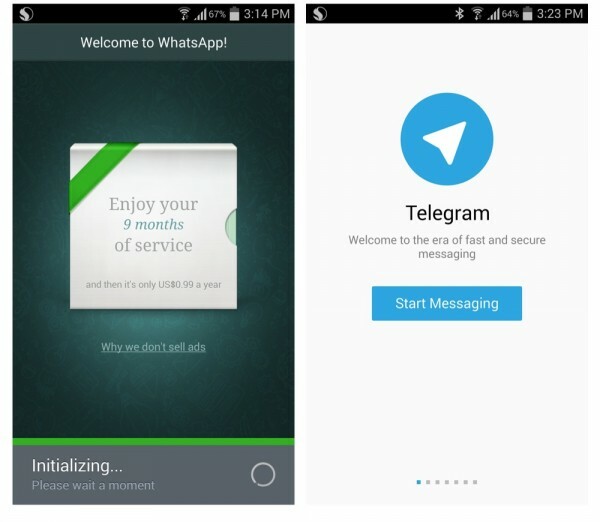 WhatsApp is slightly better as it provides more options such as the ability to capture a video within the app to send to your friend, as well as the option to send Audio notes. 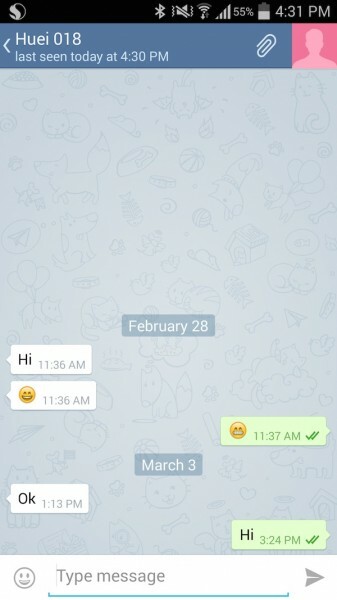 Now, this is possibly one of the most interesting features in Telegram. 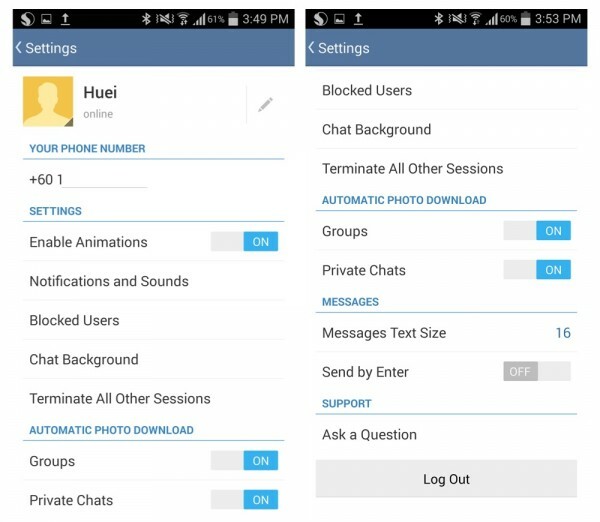 Secret Chat offers a Snapchat-like chat experience, which allow users to send self destructing messages with one another. 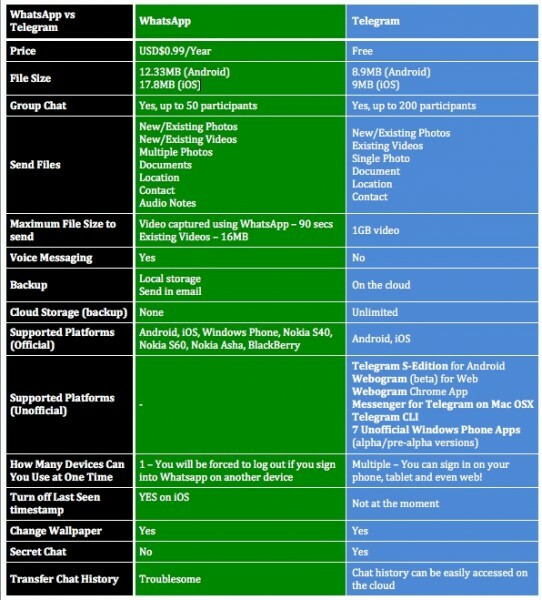 What’s different in Secret Chat is that messages are all stored locally unlike the regular ones that are stored in the cloud. 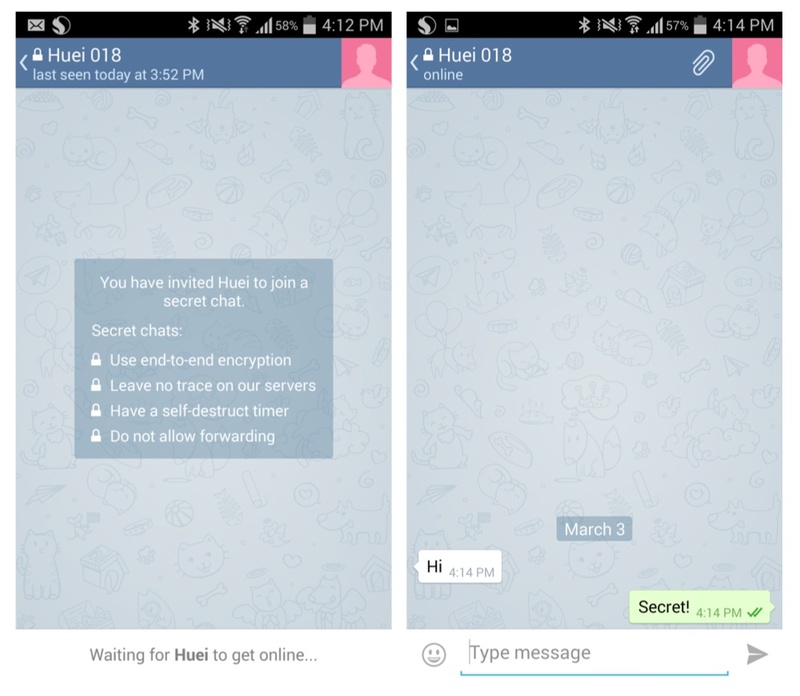 All of Telegram’s messages are encrypted but the encryption method in Secret Chat are client-to-client so technically, it means that no one else, even Telegram, can decrypt that. 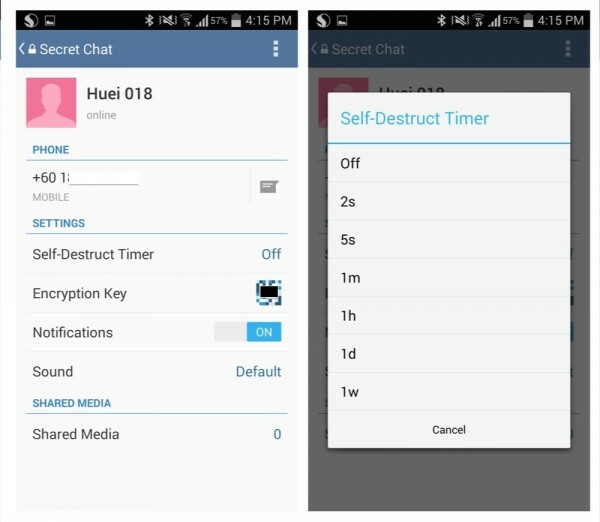 You can send messages like normal, or you can set a self-destruction timer that automatically deletes a message after a pre-set duration. Secret chat does not allow users to forward messages but unfortunately, you can screen capture and send it out, unlike Snapchat which informs the other party when one takes a screenshot. 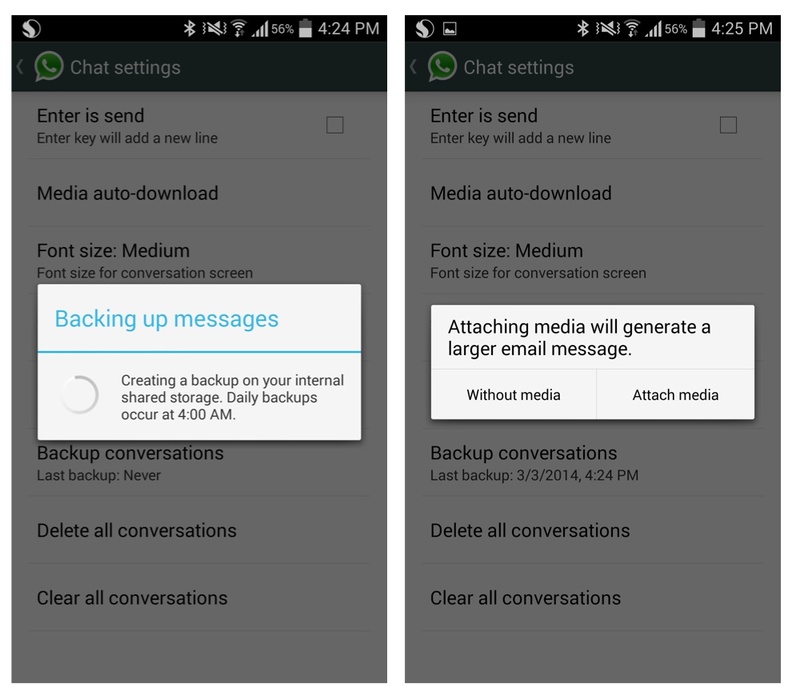 All conversations in WhatsApp are saved to your local device. You can schedule for WhatsApp to backup your conversations everyday at a fixed time, and even send your conversations out via email, if you wish to store it forever that is. You can even pick to send attachments or not. As for iOS, there’s an additional option for you to backup to iCloud, making it easier for you to migrate to another iOS device. Telegram automatically stores all your conversations in the cloud, making them accessible anywhere, as long as your account is still active. 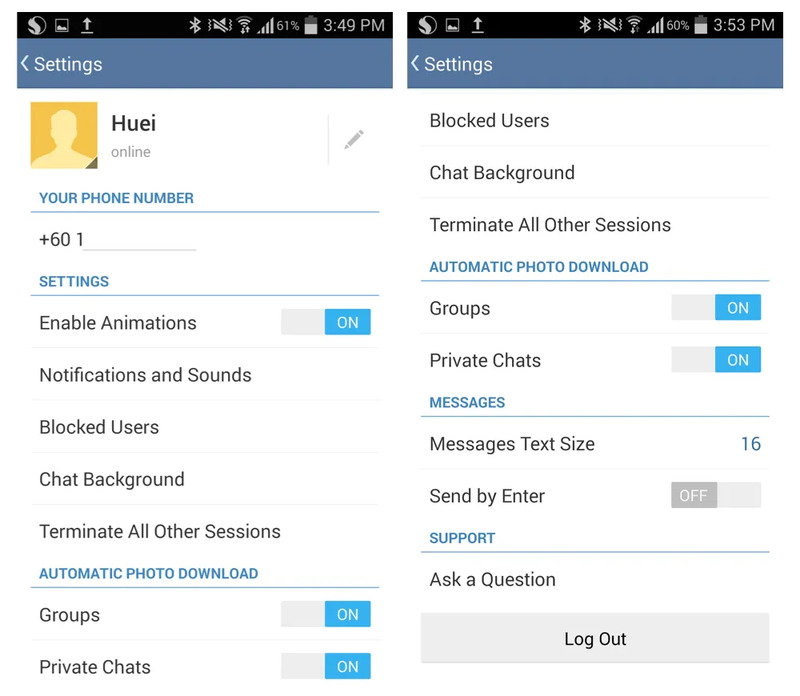 Deleting your account will remove all chat histories that are associated with your number. 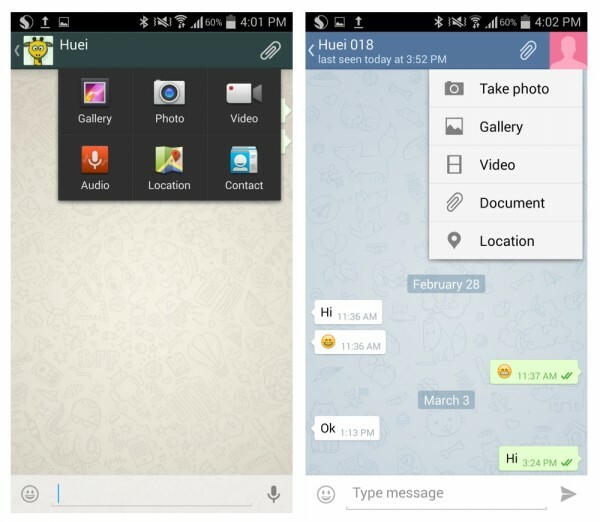 Transferring chat history on WhatsApp is possible but it’s a little tricky, requires several steps, and can only be done if you are transferring to the same devices – iPhone to iPhone, Android to Android, S60 to S60, etc. As for Telegram everything is in the cloud. This means that all your conversations will be saved in the cloud automatically, no extra step needed. 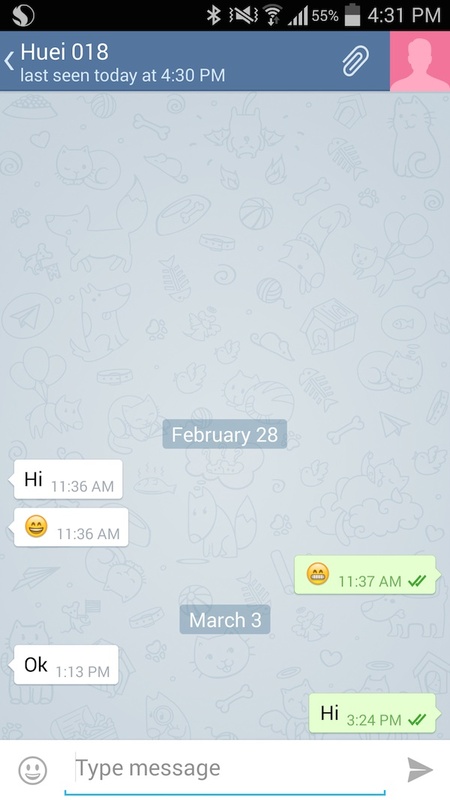 Just log into your Telegram account on any device and you will be able to see all your chat histories…except for Secret Chat of course. 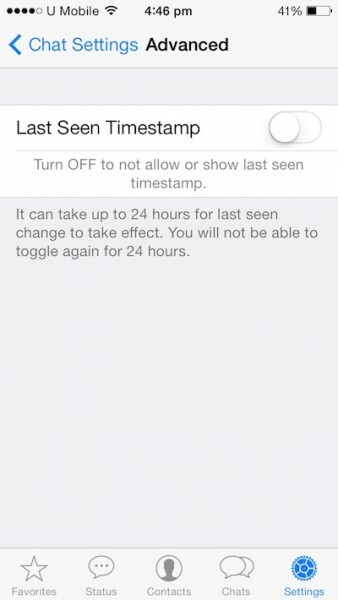 Apparently, you can hide your last seen timestamp for WhatsApp on iOS. 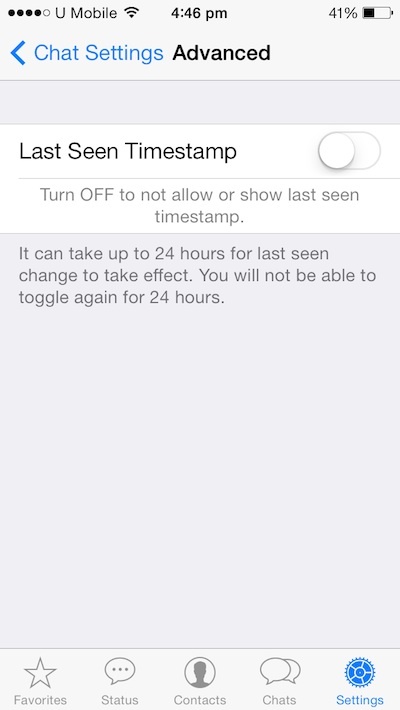 If you pull out the Settings menu in WhatsApp for iOS, under Advanced in Chat Settings, you will see an option to Turn off Last Seen Timestamp. It will take 24 hours to take effect and correct me if I’m wrong, it hasn’t been 24 hours since I discovered it, timestamp history will be turned off for both you and your contacts. This means that you will not be able to see when your friends were last online on WhatsApp and vice versa. It’s not working for me yet though, I can’t see other’s timestamp but they can see mine. As for Telegram, on the FAQ section, it says that the option is not available yet but the folks behind Telegram might implement it in the near future. WhatsApp is supported on most major mobile platforms including Android, iOS, BlackBerry, Windows Phone, Nokia S40 and Nokia S60. 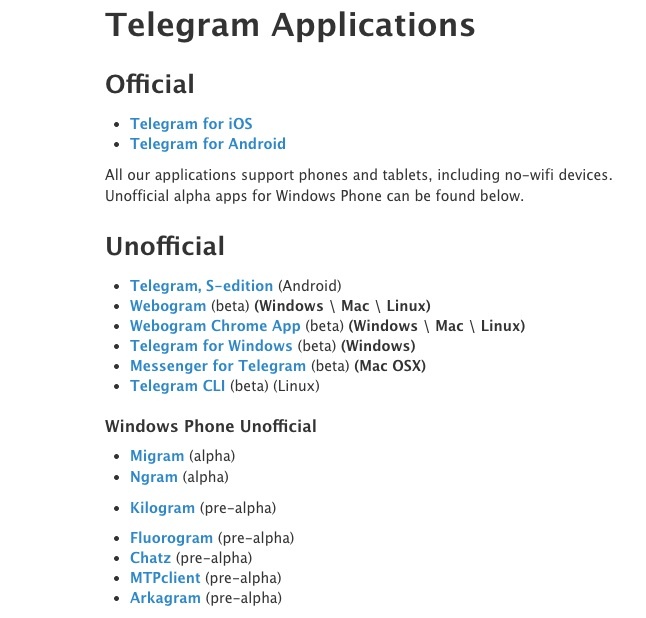 Telegram officially only supports Android and iOS but there are unofficial Telegram apps for other platforms as well including Windows Phone, web (Windows/Mac/Linus) and even an app for Mac OS X. Because Telegram allows you to sign in to different devices simultaneously, this is especially useful, it’s like having WhatsApp for desktop that I’m pretty sure everybody wish they have. However, these apps are still in their pre-alpha, alpha and beta mode and are unofficial. They are listed in Telegram’s website though, so I’m pretty they are safe to use. You know what, I just discovered Telegram last Friday and I think I already prefer it over WhatsApp but the only problem is, it’s still relatively new and not a lot of my contacts have Telegram…yet. Most of the features are pretty much the same but I love how I can use Telegram on multiple platforms, including the web. 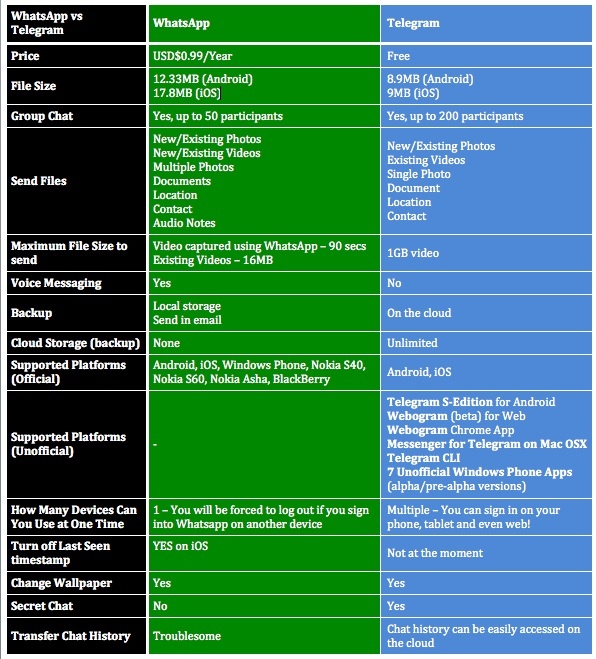 Everything is also stored in the cloud and as someone who changes phones frequently (to do phone reviews), it certainly comes in handy if I can easily access all my chat histories effortlessly. Sure, there are many other options out there, but I prefer a simple mobile messaging app without all the fancy stuffs and Telegram works perfectly. Don’t get me wrong though, I’m still using WhatsApp because it’s still one of the most popular choice and almost everybody I know already has it. Are you on Telegram already? If not, will you make the switch?